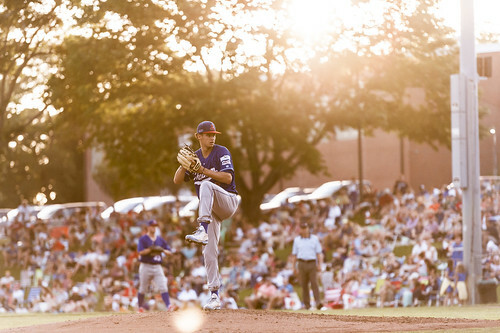 The Chatham Anglers (12-12-2) saw their record drop to .500 Wednesday night as they suffered their fourth loss of the season to the Wareham Gatemen. Thursday, the A’s are back at home to face the Bourne Braves (13-11-1) at 7 p.m.
Chatham has won just four of its last 10 games. Only the Harwich Mariners and Brewster Whitecaps have worse records over that span. The A’s have made eight errors in their last five games, a trend manager Tom Holliday said has led directly to losses. The Gatemen handled the A’s with ease for the fourth time this season Wednesday, winning the game 9-2. The visitors hopped out to a 2-0 lead before Chatham had an at-bat and never looked back. Despite cutting the lead in half in the bottom of the first via a Michael Busch (North Carolina) RBI single, the Anglers hopes gradually slipped away, allowing runs in the second, fourth, fifth and sixth innings. The seven-run loss marks the Anglers second-largest defeat to the Gatemen this summer. Only on Opening Day did the A’s lose by a bigger margin, a 12-4 defeat at Veterans Field. In the four losses, Chatham has been outscored by 22 runs. Unlike against the Gatemen, the Anglers have had nothing but success when they face the Braves. Chatham swept Bourne in a doubleheader on June 17 at Doran Park, winning 7-2 and 4-1. Austin Bergner pitched an immaculate inning — nine strikes on nine pitches — against Orleans on July 5. When the Braves visited Veterans Field five days later, the A’s achieved their biggest comeback win of the season. The home team trailed by six after the top half of the second inning before reducing the deficit to one after the fifth. In the bottom of the eighth, Ben Ramirez (Southern California) equaled the score with an RBI single. Then, Branden Fryman (Samford) stole home and Adam Fogel (Hawaii) scored Ramirez on a sacrifice fly, propelling the Anglers to an 8-6 win. Austin Bergner (North Carolina) will make his second start of the season Thursday. Bergner made his summer debut on July 5 at Orleans, tossing five innings and striking out six. The second-year Anglers player conceded three runs, all in the third inning, in an eventual 3-0 loss. Bryan Hoeing (Louisville) is scheduled to start for the Braves. The right-hander has logged 16.1 innings in four appearances (three starts) on the summer. Hoeing sports a 4.95 ERA and has allowed 13 runs on 22 hits while striking out 17.